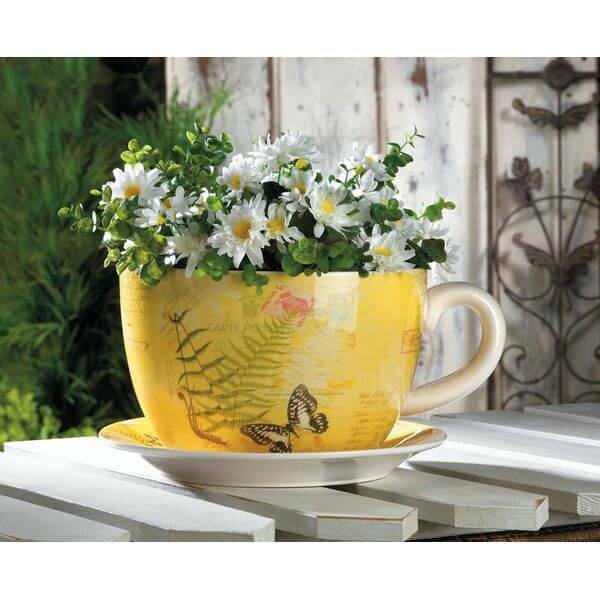 Invite some cheerful butterflies to visit your flowers with the lovely Gifts & Decor Butterfly Print Teacup Flower Pot. Crafted out of dolomite, the teacup pot and drainage saucer features a colorful print with orange, blue and brown butterflies and a mix of flowers and leaves. A hole in the bottom is pre-drilled for drainage. Oversized teacup is a unique and playful planter ..
Come with highly glazed finish ..
Bring some of the beauty of the Italian countryside to your decor with the Original Cucina Italiana Ceramic Teacup Flower Pot. This lovely oversized teacup is made for plants, not for beverages with a self-watering design to help herbs and flowers thrive. 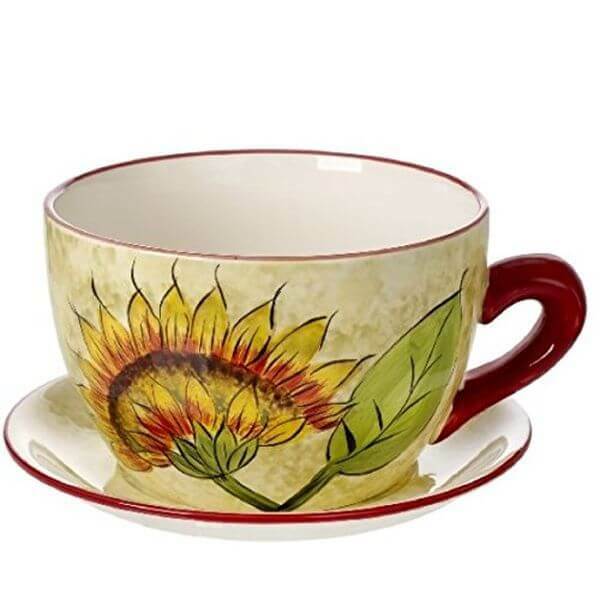 A Tuscan flower motif is painted on the side of the cup. The ‘Petite Flowers’ Tea Cup Flower Pot is a charming way to plant herbs and other small plants and show them off in your home. 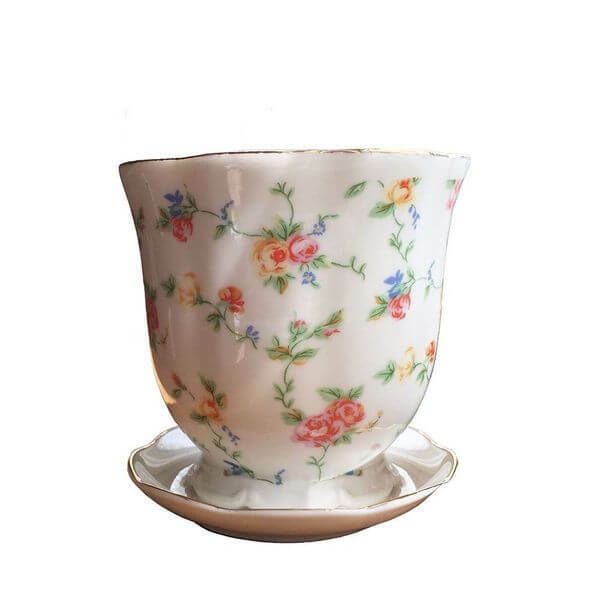 Crafted out of glass china, the teacup is patterned after antique teaware with its all-over pastel floral motif and elegant metallic gold trim. There’s no daintier way to plant herbs and small plants than in the ‘Wildflower’ Tea Cup Flower Pot. 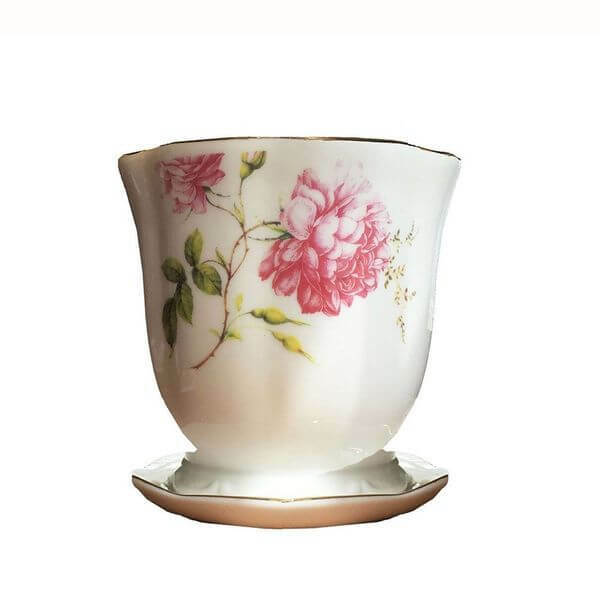 Sweet and chic, this planter is cleverly disguised as a teacup and saucer and features a beautiful pink wildflower motif. Gold trim runs along the rim of the cup and the edge of the saucer. The Large Garden Butterfly Teacup Planter is sure to earn you compliments, as it’s one clever, pretty way to pot a plant! A two-piece set, the planter includes a sunny yellow teacup pot with a shabby chic graphic and a coordinating saucer drainage tray. Both pieces are fashioned out of luxurious dolomite. 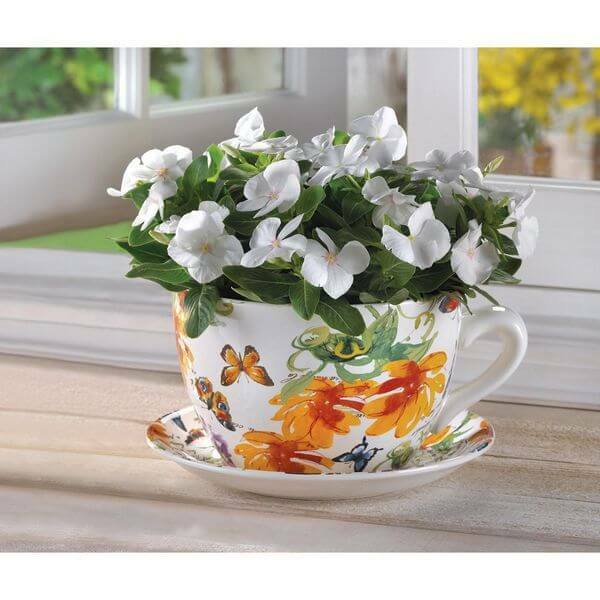 A beautiful plant becomes even prettier in the Gifts & Decor China Rose Teacup Flower Pot! 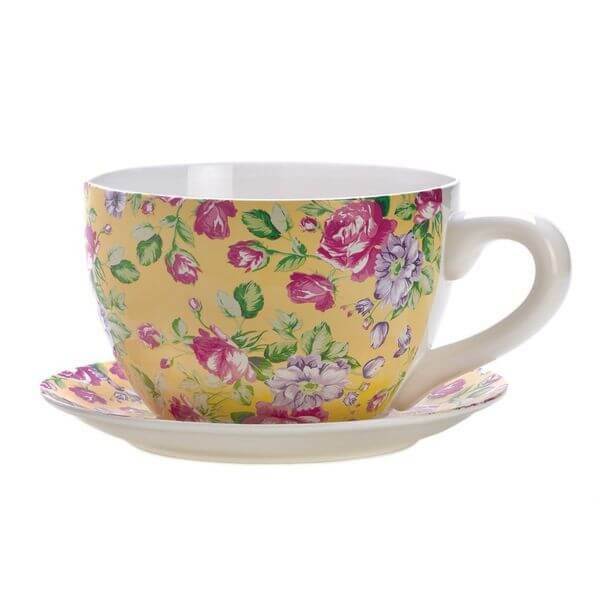 This dainty pot is designed to look just like a feminine teacup with a pink, purple and green floral print on yellow. The drainage tray has a matching print and fits beneath the cup like a saucer.